Every now and then, we get an inquiry that we absolutely cannot refuse – simply because it is just way too awesome. Our most recent commission came from one such inquiry – it made us laugh out loud, and we couldn’t wait to get started. Our client wanted to create an epic conversation piece for his home and a great gift for his partner. 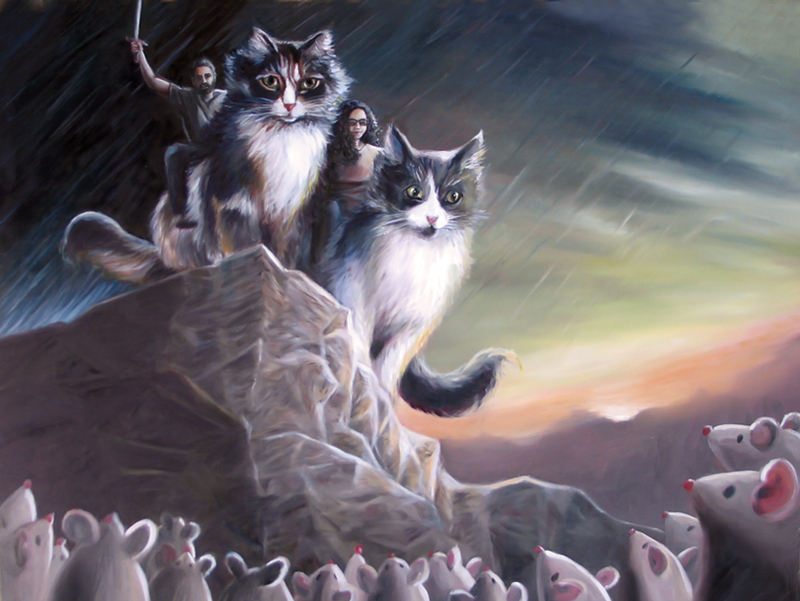 Since the couple has two cats that are a huge part of their lives, he wanted the painting to show him and his partner mounted on top of their cats like horses, overlooking a valley of mice below. Completely random, but completely awesome, and so we jumped at the chance to fulfill this request. We are thrilled with the way it turned out and happy that the art will be talked about in their home for years to come.